Zionism, The Nakba And Feminism | Jews Say No: Not In Our Name! What is Shire actually saying? Some history is required to answer that question. An understanding of Zionism cannot be separated from an understanding of the Nakba (the catastrophe in Arabic), which refers to the expulsion of approximately 750,000 Palestinians from their land and homes during the establishment of Israel in 1948. 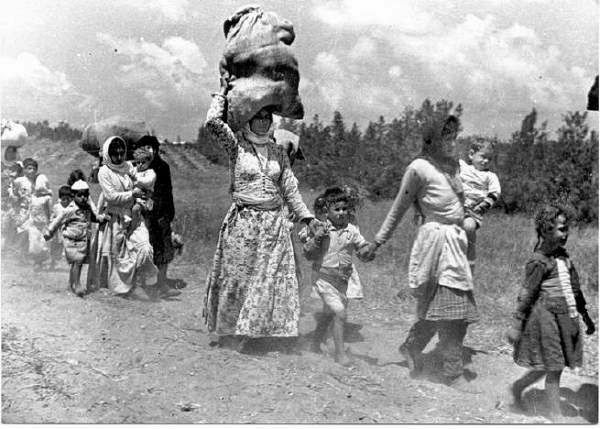 The history of the Nakba has been thoroughly documented, including by Palestinian, Israeli, and other historians. I know about Zionism from my own relationship with it. I had some serious unlearning to do. When I was younger, I, too, identified as a Zionist (a “socialist feminist Zionist”) until I realized that my image of Zionism as the Jewish national liberation movement was seriously misguided. Instead, I learned that what had been done and was still being done to Palestinians in the name of Zionism was theft of land and denial of a people’s right to freedom and national liberation. It was about the privileging of those who were Jewish over Palestinians. This was not just about Israel’s military occupation of Palestinian lands that began in 1967, but was fundamentally about what happened before and during the creation of the State, and what continues to happen today. In Israel, as well as in the U.S., the Nakba is often disregarded or denied altogether. Instead, the focus is on the creation of Israel as a haven for Jews, completely ignoring the mass dispossession of the Palestinian people. But the Nakba is not only about the past; it is ongoing. Palestinian women, men, and children continue to be pushed off their lands and their homes and denied their basic freedom and rights. Israeli apartheid is woven into the fabric of society, and it is taking brutal forms. Home demolitions, ongoing construction of settlements, land confiscation, arrests, torture of prisoners, and military assaults are just some of what Palestinian families endure on a daily basis, not to mention lack of access to basic rights such as education, healthcare, employment, and the right to live with dignity. What Shire’s feminism seems to ignore is that Palestinian women are forced to give birth at checkpoints; their homes are bulldozed because permission to build is denied from racist Israeli authorities; Palestinians face systemic discrimination wherever they are living; and mothers and fathers live in fear that Israeli soldiers or settlers will injure, imprison, or kill their children. Zionism and Israel have always afforded preferential treatment to Jewish women—and men—over Palestinian women and men, in all aspects of life. This is the Zionism and the Jewish state Shire says is consistent with her feminism. Instead of asking whether Zionists have a place in the feminist movement, perhaps the question that Shire should be asking is: How can someone who considers herself a supporter of feminism, which is a movement for justice and liberation that challenges patriarchal power and all forms of oppression, also consider herself a supporter of Zionism, a movement that denies the basic values of equality and fairness. The women’s day strike was intentionally and critically rooted in an anti-colonial feminism that is liberatory and multidimensional and that has as its foundation a deep commitment to social transformation and to resisting “the decades long economic inequality, racial and sexual violence, and imperial wars abroad.” If Shire has an interest in being part of such an inspiring movement, rather than supporting Zionism, she might want to stand with the Palestinian-led grassroots movement for justice and with the growing number of women around the globe who are committed to equal rights for all peoples living in Palestine and Israel. What could be more feminist than that? Donna Nevel, a community psychologist and educator, is a coordinator of PARCEO, a participatory action research center. She is an organizer for justice in Palestine/Israel; against Islamophobia and anti-Arab racism; and for justice in public education. She is a founding member of Facing the Nakba Project, Jews Say No!, Parent Leadership Project, and Network Against Islamophobia, and was a co-founder of Jews for Racial and Economic Justice in NYC. This entry was posted on March 15, 2017 at 7:01 am and is filed under Uncategorized. You can follow any responses to this entry through the RSS 2.0 feed. Both comments and pings are currently closed.